Ancient Greek medicine was a compilation of theories and practices that were constantly expanding through new ideologies and trials. Many components were considered in ancient Greek medicine, intertwining the spiritual with the physical. Specifically, the theories and ideologies from which ancient Greek medicine derived included the humors, gender, geographic location, social class, diet, trauma, beliefs, and mindset. Early on, ancient Greeks believed that illnesses were "divine punishments" and that healing was a "gift from the Gods." As trials continued wherein theories were tested against symptoms and results, ancient Greek medicine also grew such that the pure spiritual beliefs as to "punishments" and "gifts" were converted to a foundation based in the physical, i.e., cause and effect. Ancient Greek medicine began to revolve around the theory of humors. Humoral theory states that good health comes from perfect balance of the four humors blood, phlegm, yellow bile, and black bile. Consequently, poor health resulted from improper balance of the four humors. Hippocrates, known as the "Father of Modern Medicine", established a medical school at Cos and is the most important figure in ancient Greek medicine. Hippocrates and his students documented numerous illnesses in the Hippocratic Corpus, and developed the Hippocratic Oath for physicians, which is still in use today. The contributions to ancient Greek medicine of Hippocrates, Socrates and others had a lasting influence on Islamic medicine and medieval European medicine until many of their findings eventually became obsolete in the 14th century. In Book I of The Iliad when a plague fell on the Achaean soldiers, causing scores of them to die, the soldiers began to think that it was a result of Apollo's anger over Agamemnon's treatment of Chryses. In order for them to be cured they would have to sacrifice to him and appease the angered god, which when done successfully lifted the plague. Based on this, historians believe that ancient Greeks saw disease as a work of angered gods, and the only way to be cured was through prayer and sacrifice to that god. Another way ancient Greeks sought relief from their ailments was through help from the healing god Asclepius. 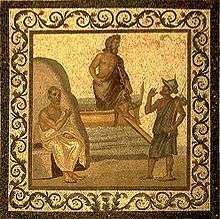 Although disease was seen as a work of the gods, cases of injury and trauma were dealt with more practically, based on descriptions in the Iliad. The Achaeans had dedicated healers, specifically Machaon, who was often described dealing with the injuries associated with war. The treatments used were very rudimentary, and consisted mainly of herbs, bandages and wine. 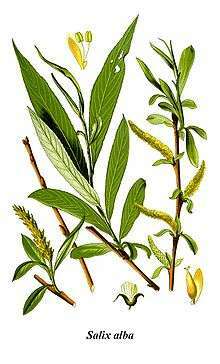 The herbs used were generally meant to be analgesics or used for coagulation to prevent bleeding out on the battlefield. Along with practical treatment, it was common for the healers to offer a prayer along with treatment because there was still a belief that gods could and would heal at their discretion. During pre-Hippocratic times, human dissection was strictly forbidden which made learning about the internal human anatomy extremely difficult. Still, the Iliad discussed human anatomy with reasonable accuracy, suggesting there must have been some anatomical knowledge during the pre-Hippocratic era. There were references to approximately 147 different body parts throughout the Iliad, including specific terms such as thorax, bronchi, lungs, and diaphragm. According to the Iliad, the ancient Greeks also attempted to perform rudimentary surgeries, although whether they were done only on the battlefield or in day-to-day life is unknown. There are multiple times throughout the Iliad in which someone is described using a knife to surgically remove an embedded arrow and then treating the wound, showing understanding of basic surgical practices. 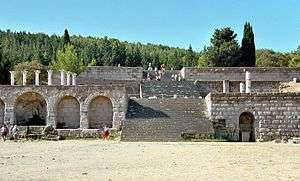 Following Theophrastus (d. 286 BC), the Lyceum failed to produce any original work. Though interest in Aristotle's ideas survived, they were generally taken unquestioningly. It is not until the age of Alexandria under the Ptolemies that advances in biology can be again found. 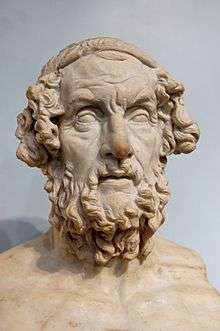 The first medical teacher at Alexandria was Herophilus of Chalcedon, who differed from Aristotle, placing intelligence in the brain, and connected the nervous system to motion and sensation. Herophilus also distinguished between veins and arteries, noting that the latter pulse while the former do not. He did this using an experiment involving cutting certain veins and arteries in a pig's neck until the squealing stopped. In the same vein (no pun intended), he developed a diagnostic technique which relied upon distinguishing different types of pulse. He, and his contemporary, Erasistratus of Chios, researched the role of veins and nerves, mapping their courses across the body. 1 2 Cartwright, Mark (2013). "Greek Medicine". Ancient History Encyclopedia Limited. UK. Retrieved November 9, 2013. ↑ Bendick, Jeanne. "Galen – And the Gateway to Medicine." Ignatius Press, San Francisco, CA, 2002. ISBN 1-883937-75-2. ↑ Grube, G.M.A. (1954). "Greek Medicine and the Greek Genius". Phoenix. 8 (4): 123, 135. doi:10.2307/1086122. 1 2 Askitopoulou, H., Konsolaki, E., Ramoutsaki, I., Anastassaki, E. Surgical cures by sleep induction as the Asclepieion of Epidaurus. The mistory of anesthesia: proceedings of the Fifth International Symposium, by José Carlos Diz, Avelino Franco, Douglas R. Bacon, J. Rupreht, Julián Alvarez. Elsevier Science B.V., International Congress Series 1242(2002), p.11-17. ↑ Kaba, R.; Sooriakumaran, P. (2007). "The evolution of the doctor-patient relationship". International Journal of Surgery. 5 (1): 57–65. doi:10.1016/j.ijsu.2006.01.005. ↑ Chadwick, edited with an introduction by G.E.R. Lloyd ; translated [from the Greek] by J.; al. ], W.N. Mann ... [et (1983). Hippocratic writings ([New] ed., with additional material, Repr. in Penguin classics. ed.). Harmondsworth: Penguin. p. 206. ISBN 0140444513. ↑ Chadwick. Hippocratic Writings. p. 94. ISBN 0140444513. ↑ William Harvey (1628). Exercitatio Anatomica de Motu Cordis et Sanguinis in Animalibus (in Latin). Frankfurt am Main, Germany: Sumptibus Guilielmi Fitzeri. p. 72. ISBN 0-398-00793-4. Retrieved 7 August 2010. ↑ Theodore J. Drizis (Fall 2008). "Medical ethics in a writing of Galen". Acta Med Hist Adriat. 6 (2): 333–336. PMID 20102254. ↑ Cosans C (1997). "Galen's Critique of Rationalist and Empiricist Anatomy". Journal of the History of Biology. 30: 35–54. doi:10.1023/a:1004266427468. ↑ Heinrich von Staden, "Liminal Perils: Early Roman Receptions of Greek Medicine", in Tradition, Transmission, Transformation, ed. F. Jamil Ragep and Sally P. Ragep with Steven Livesey (Leiden: Brill, 1996), pp. 369-418.